SLIM-IT® is a project implementation and management framework. It works because it literally surrounds process improvement tools and activities with human factors as part of its structure. Most projects aimed at process improvement leave out the change management element and instead gravitate automatically to process improvement tools (i.e. Kaizen Events), training, teamwork and technology. We know that without the necessary organizational engagement to hold improvement methods in place, they quickly fall away. In this model, the three outer bands are all people-systems. 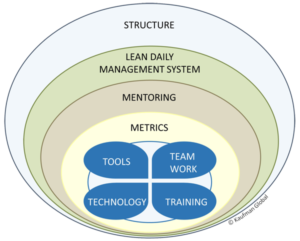 At the center of the SLIM-IT model are the methods and techniques (Operational Excellence, Lean and Six Sigma) that attack waste and variation in any process. Training, up-skilling and capability development are essential for sustainability. Technology plays a role once process capability is understood and improved to the extent possible using teamwork and more standard, hands-on problem-solving approaches. Of course we do a lot of typical project management work wherever we engage. Things like: project tracking, reporting, milestones, financials and benefits build-up. SLIM-IT ensures we are getting the big picture right as we dive deep into the details. Want to learn more about SLIM-IT? We’ll show you how to move your initiative forward fast and effective. It starts with a talk. What Can Kaufman Global Help You Solve?